Researchers at the Nanoscience Center at the University of Jyväskylä, Finland, have made a new opening in nanomaterial research. Opening's essence resides in the exclusive use of metallic elements in flat, atomically thin nanostructures. The best known flat nanomaterial is graphene. Graphene is stable because the non-metallic element carbon prefers covalent, directional bonds that effectively cause structural planarity. 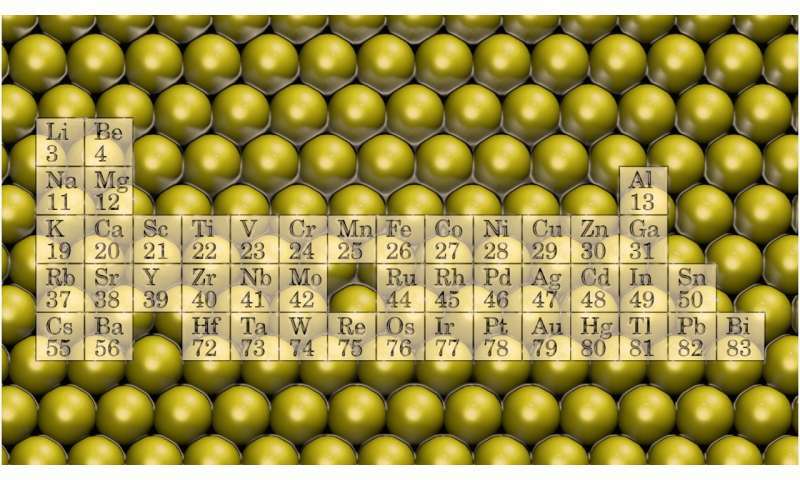 Metallic bonds are less directional, whereby metals often coalesce into compact clusters. However, recent experiments suggest that, by using pores in other nanostructures, even metals can be stabilized into atomically thin planes. Inspired by these experimental indications, researchers at the Nanoscience Center, University of Jyväskylä, used computer simulations to predict systematically the properties of atomically thin structures made exclusively from metallic elements. "We made a new opening in material research, which was basic research, but highly rewarding as such," says postdoctoral researcher Janne Nevalaita. "One could say that we hit on an untouched estate, bulldozed it and created a foundation. Now others can build solid scientific structures based on that foundation," he continues. According to the simulations, the flat metals inherit their properties predictably from conventional three-dimensional metal structures. The study appeared in Physical Review B, a journal published by the Americal Physical Society. It was selected as an Editor's suggestion and highlighted as an esteemed Physics synopsis.